Thank you for visiting our home page. We are the largest judges association in North America, and proud to include members from all jurisdictions and levels of courts throughout the United States and Canada. We are also closely affiliated with a wide range of other national organizations, including the National Center for State Courts, the National Association of State Judicial Educators, the Conference of Chief Justices, the Conference of State Court Administrators, and the National Association for Court Management. Read the president's full message. Long-time AJA member Elizabeth “Libby” Hines was recognized last week at the U.S. Supreme Court, receiving the William H. Rehnquist Award for Judicial Excellence – congratulations, Libby! The National Center for State Courts has developed a three-minute “explainer” video about the role of state courts in our democracy. The video explains why the Founding Fathers elevated the judiciary to its status as the government’s third and equal branch. AJA has done 11 interviews with leading figures nationally on how to improve perceptions of fairness in our courts. 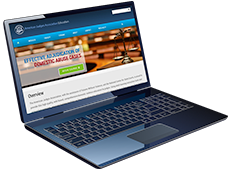 A free, online, comprehensive Domestic Violence educational resource for judges. This course contains interactive modules on key topics which will allow judges to learn at their own pace from leading national experts. A Canadian judge gave specific note to the usefulness of Judge Wayne Gorman’s piece in Court Review on the Canadian law of bail. The AJA Executive Committee recently endorsed two resolutions. The first supports due process and judicial independence in Turkey, and the second looks at various aspects of the issue of pre-trial release. 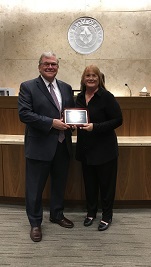 AJA Past President Bonnie Sudderth presented the 2018 Harold V. Froehlich Judicial Courage Award to Judge R.H. Wallace, Jr. of the 96th Judicial District Court in Ft. Worth, Texas (pictured left). In addition, AJA was pleased to present the Chief Justice Richard W. Holmes Award of Merit to Chief Justice Scott Bales of the Supreme Court of Arizona and the Libby Hines Domestic Violence Award to Chief Judge Berryl Anderson of the Dekalb County Magistrate Court in Decatur, Georgia. Other awards presented included the Nachtigal Award (to a non-judge who has made substantial contributions toward the judiciary) to Fred Nachtigal, the Judge Elliott Zide Award (for Judicial Education) to Judge Betty Thomas Moore and Justice Robert J. Torres, and the Burnett Award (for contributions by a member to AJA) to John B. Williams. 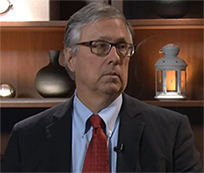 The American Judges Association, at its annual conference in Seattle, adopted the latest in a series of white papers focusing on procedural fairness. The paper, “The Judge is the Key Component: The Importance of Procedural Fairness in Drug-Treatment Courts,” can be found here. The National Center for State Courts (NCSC) invites all judges who preside over adult and juvenile cases involving community supervision, including pre-trial and probation, to join a listserv. This listserv will serve as a secure and confidential means for judges across the country to engage in open discussions about current local and national issues in community supervision. Judges and the NCSC will have the ability to post informational items as well as to pose questions to other listserv members and engage in discussions. To join the listserv, send an e-mail to listserv@listserv.ncsconline.org. In the body of the message, type: join Judges-CommunitySupervision. Then follow the instructions in the return message to confirm the request. Please contact Michelle White at mwhite@ncsc.org with any questions or for additional information. AJA announces completion of an updated booklet for judges on domestic violence - Domestic Violence and the Courtroom, Knowing the Issues... Understanding the Victim.